This is one dish that I love, love, love but none in my family does (although they love Korean food!). So I always end up with a big pot of the soup, all for myself, that I can heat and re-heat for several days. My love affair with this dish started many years ago, when we still lived in Seattle. There was this amazing Korean restaurant in Edmonds called Ho Soon Yi, where they serve this absolutely delicious soup along with other equally scrumptious Korean delicacies. Needless to say, I have not looked back and have since attempted to cook them myself several times. After trying so many recipes, to me anyway, this one is the best. In a saucepan, boil water, anchovies and Dashima until the stock is reduced to half. Set aside. Alternatively, if you don't have access to good Asian store, you can substitute the stock with 1 cup of clam juice. Heat the sesame oil in the large saucepan, add beef and garlic, saute until the beef is no longer pink. Add 1 tbsp of red pepper powder, Kimchi and Kimchi juice. Stir well. Pour anchovi/Dashima stock into the saucepan , bring to boil. Add tofu and seafood into the soup, gently breaking up the tofu with the spatula, but be careful not to completely mash the tofu. Season with salt if necessary. Continue cooking until all the ingredients are done. Transfer to pre-heated Ttukbaegi (or regular bowl) immediately. 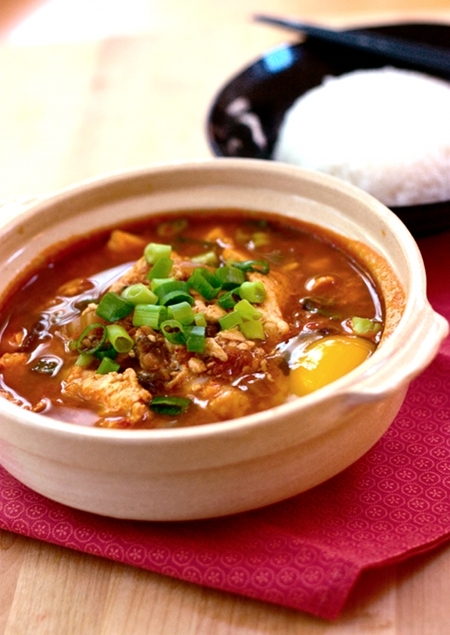 Break the egg over the soup and sprinkle with chopped green onions. Serve with steamed rice. 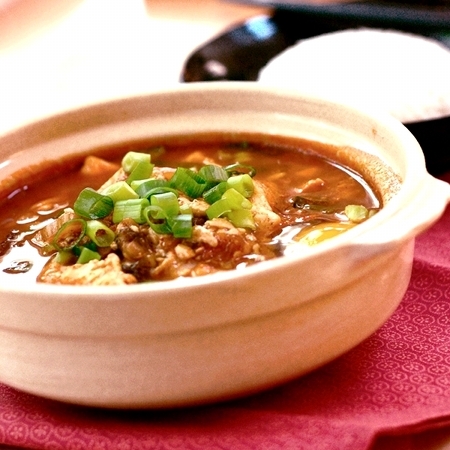 This soup is pretty famous in Korean drama :D Thank you for sharing!! Wanna try it this weekend.